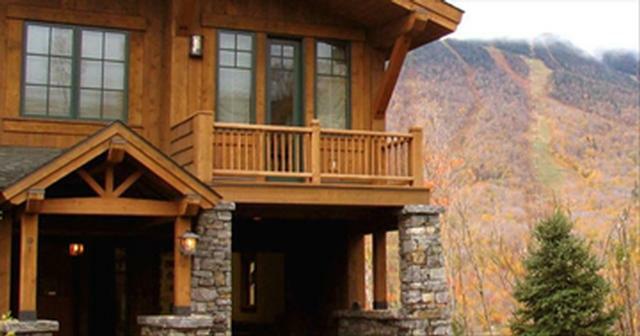 Four bedroom, six bathroom slopeside home in the exclusive Spruce Peak Resort at Stowe. This 3,000 square foot home has 7 plasma TVs, a baby grand piano, outdoor barbecue grill, 3 decks, chef's kitchen, entertainment system that includes DVD and CD players in every room, and iPod/MP3 hook up to the main level stereo system. The den/wet bar room opens to the outside hot tub that overlooks the ski trails, a lake, the golf course and breathtaking views. There's even a highchair and exersaucer. GOLF! OLYMPIC POOL, SPA, FITNESS CENTER, SPRUCE PEAK PERFORMING ARTS CENTER! OUTDOOR CONCERTS! KIDS' ACTIVITIES, KIDS' CAMPS GREAT RESTAURANTS, HIKING, AND MORE! The owner is a FOUNDER so renters can use the Stowe Mountain Lodge spa, solarium, heated pool, 3 hot tubs, and fitness center with locker, robes and slippers for only $10 a visit. And, children under 15 are free! Regular rate is $40 per person. Stowe Mountain Lodge and Golf was voted #1 in America by Conde Nast. No matter what your handicap is, the Bob Cupp classic course offers enjoyment for every golfer. THE MOST BEAUTIFUL MOUNTAIN VIEWS IN STOWE! Inspiration Lane at SPRUCE PEAK is ideal for Family Vacations, Wedding Guests, Reunions, Birthday Celebrations, Retreats, and Romantic Getaways. This state of the art home has one of the best locations on the mountain AND there are fun activities for EVERYONE! *****VISIT STOWE! *****Located in the exclusive Spruce Peak community, guests enjoy golf privileges at the Stowe Mountain Club's 18-hole Bob Cupp Championship Golf Course during the Spring, Summer and Fall. The alpine slide and world-class hiking are within walking distance. In winter, enjoy the ski-in/ski-out convenience to either Spruce Peak or Mt. Mansfield. ***LAYOUT OF YOUR VACATION DREAM HOUSE***This immaculate mountain cabin is laid out on three floors. Clean and uncluttered. The Mountain Cabin has an intercom and sound system on all floors. It also features Aprilaire Climate control (heat & A/C) throughout. Upstairs: Grand scale Living Room and Dining Room with cathedral ceilings and fireplace. Deck overlooking ski trails with spectacular views, new grill, outdoor lounge chairs. The chef's kitchen has granite counter tops and counter seating. All new top-of-the line appliances include a Sub Zero fridge, 6-burner duel-fuel Viking range and microwave, Bosch dishwasher, and U-Line wine fridge. 2nd Master Bedroom with Deck, huge Bathroom with Jason aromatherapy tub and separate shower. Half Bathroom near Kitchen. Middle Level: Large entrance hall with high ceilings, coat closet, and Half Bathroom, Master Bedroom with Deck and Fireplace, and Master Bathroom with Jason aromatherapy tub, towel heater, and large separate shower. Huge windows with spectacular Mount Mansfield ski trail views. Garage, and outside storage closet for skis, bikes, and more. Lower level: Thick carpeting, two Bedrooms, each with private Bathroom and Jacuzzi tub. Front Bedroom has bunk beds and a walkout to Hot Tub. Family TV Room/Den with walk out to Hot Tub. Also has Fireplace and Bar, refrigerator and microwave, Washer/Dryer room.